5 Tips For Layering Paint That Will Get You Excited! We're sharing 5 AWESOME and EASY tips for layering paint so you can create beautifully blended paint colors on your furniture and DIY home decor! In this tutorial, you'll learn how to blend and layer paint onto a mirror with these easy color layering and blending painting tips! This painting technique can absolutely transfer over if you're looking to layer multiple paint colors on your furniture as well! 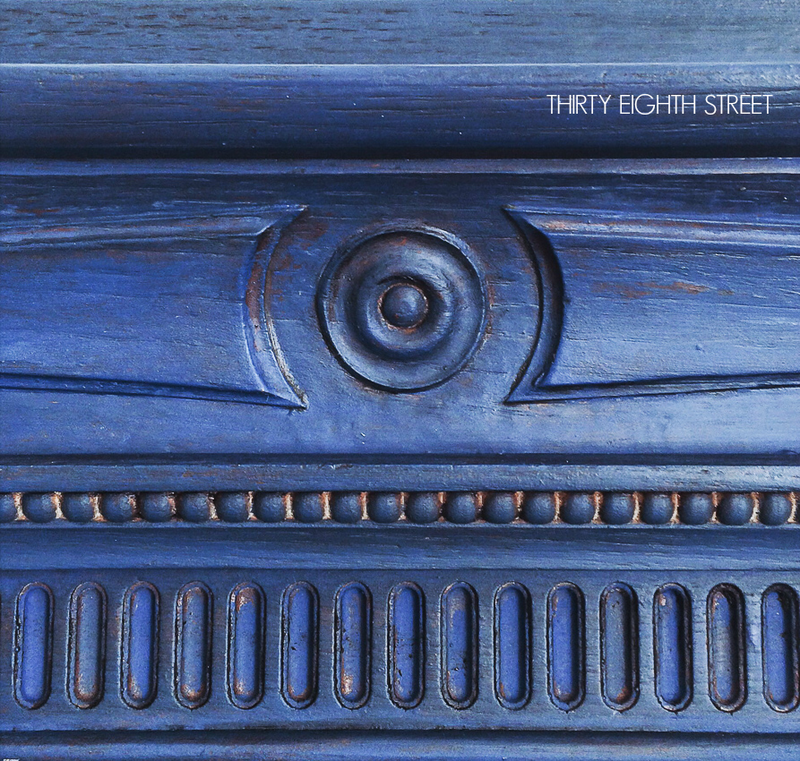 You won't believe how easy it is to create high end looking furniture from your thrift store finds using this layered painting technique! Disclaimer: This post contains affiliate links to products I love and use everyday. You can view our full disclosure here. Painting mirrors are one of my favorite things to paint. Because I'm not a patient person. Not many of us are, right!? And if you're like me then you enjoy a pretty furniture before and after that's EASY! 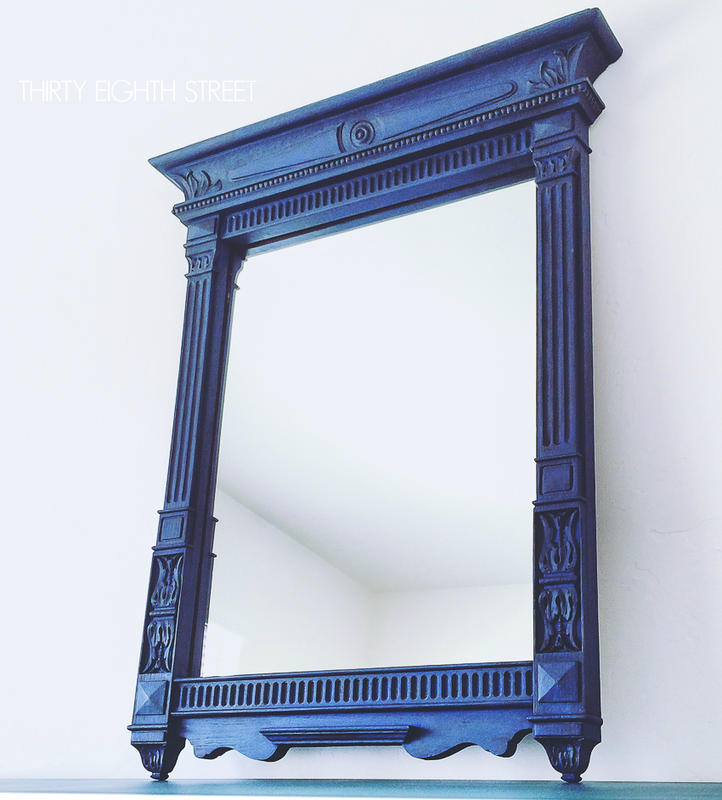 Whether you're just starting to learn how to paint furniture or if you've been painting for awhile and you've never tried your hand at painting a mirror.. Friends, paint a mirror! It's the perfect sized project to learn how to layer multiple colors of paint. In as little as an hour, you'll be able to say good-bye to your old mirror and hello to a pretty new one! How do you layer paint on furniture? Layering paint is an advanced painting technique where you layer your paint colors one after the other to build up a unique paint finish. But, don't let the word "advanced" scare you. You CAN totally do this! It's not hard, it just takes a little practice to achieve the right color balance and preferred blended look that YOU'RE going for. Is there an official name for this technique? Is there only one way to layer paint? No! There are a few ways that you can get a layered paint finish for your furniture and home decor accessories and because we're keeping this tutorial simple and EASY, I'm going to refer to these methods as if I was in an elementary math class! Paint your project in your first paint color. *Seal it with a top coat. I like to use GFHP. Then, paint your second color on top of the first. Distress your piece to reveal your first paint color. *I recommend sealing after the first coat of paint with this method because when you distress the top paint layers, you won't distress through your initial base paint color. The next method is my favorite. I call it the (addition method) and its the one that I use when I'm layering paint on my furniture. Put a little bit of your second paint color on your paintbrush, and dry brush it over your project. Repeat until you have enough of your second paint color to your liking. Put a little bit of your third paint color on your paintbrush, and dry brush it over your project. In the (addition method), you're continuingly adding layers of paint to achieve the look that you want. In the (take away method), you're adding paint colors but then taking some away of them to reveal the colors of paint underneath. There are a few things to think about when you're layering paint. But, don't think too hard because my very first tip for you is to HAVE FUN! When I'm painting or trying a new technique, I find that when I'm relaxed and not stressing about getting the perfect finish, my projects always come out beautiful. And usually when I stress over them!? Somehow, it just doesn't go as smoothly as I had hoped for. Tip #2: Layering Paint Is Not Science, It's An Art! Say that to yourself over and over again! You could give two advanced furniture painters the same paint colors and the same piece and ask them to give you a pretty layered finish and those two projects would not come out looking the same. There is a lot of interpretation that goes into layering paint. So, continue to be inspired by the layered finishes you see, but DO YOU! Don't get frustrated because your finish doesn't look exactly like somebody else's project. Gather your inspiration, go for it and don't forget Tip #1. This is the one time where you have permission to color outside the lines! Tip #3: Color Choices Matter! If you're going for a bohemian or a bold artsy look, sure you could pick 8 different paint colors to work with. I can't guarantee that you'll love the results using all of those colors, but remember Tip #2- Layering Paint is an art so if your furniture is your canvas, by all means go for it! We didn't use a lot of paint colors in this example but we still kind of got furniture artsy RIGHT HERE! If you're just starting out or you're looking for a more subtle paint finish, I highly recommend that you start out practicing layering paint with a maximum of 2-3 shades of paint. As you get more proficient at layering paint (AND YOU WILL!) then experiment and add in more hues and shades on your next project. Tip #4: Save Yourself Money And Create Your Own Paint Colors! You don't need to buy a lot of different paint colors just because you're painting in layers. I mean you can, but you don't have to! I recommend having both white and black paint on hand because you can create your own paint colors just by adding a little bit of white paint or black paint to your base paint color. Adding small amounts of white or black paint to your initial color will give you several complimentary hues within the same color family. This is an easy way to create beautiful gradual shades when you're blending paint! For example, when I layered paint on this mirror, I used two base colors then I simply added a little white and a little black paint to one of the colors and suddenly I had several shade variations that worked really well together. You can see the different paint colors it created below. Tip #5: Layering Paint Doesn't Mean Full Coverage! You don't have to completely cover your project with a full coat of paint for each layer. I mean, you can and that might be how you paint if you're using the (take away) method. However, my personal preference when layering paint is to leave some of the original wood grain showing through. Because that adds another layer. ;) I also prefer to add my other paint colors in a random no-method-to-the-madness kind of way. I'm definitly not strategic. Which means I'm not painting on my entire project in my first color and then applying the next color to cover up all of the 1st color and then applying my third color to entirely cover up the 2nd paint color. I don't always highlight the high points and darken the low ones- I'm not contouring my face! So that means, sometimes I splatter paint on purpose with my paintbrush to add color and texture. (See image above). And sometimes I take my paintbrush and paint in different directions. Remember Tip #2, this isn't science! 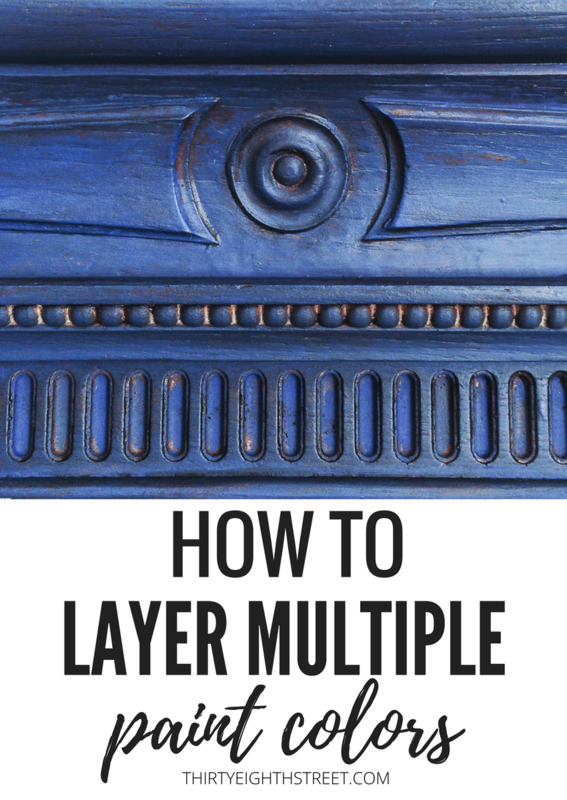 I hope this helps you realize that there are lots of different ways to achieve a layered look and that this gives you the creative freedom and encouragement to give layering paint a try! If this mirror draws you in, KEEP READING and I'll show you exactly how we got this layered paint finish for this mirror! And if you enjoy looking at pretty before and after furniture makeovers and want to receive FREE furniture tutorials and tips for refinishing furniture, sign up below and we'll send you our free 9-Page Furniture Painting Guide and notify you when we have new furniture makeovers to share! * General Finishes Klein Blue or Dixie Belle Bunker Hill would be a pretty substitute if you didn't want to go with Annie Sloan Chalk Paint. Here's what we started with! It was a fantastic score from an estate sale. Would you look at those details!? 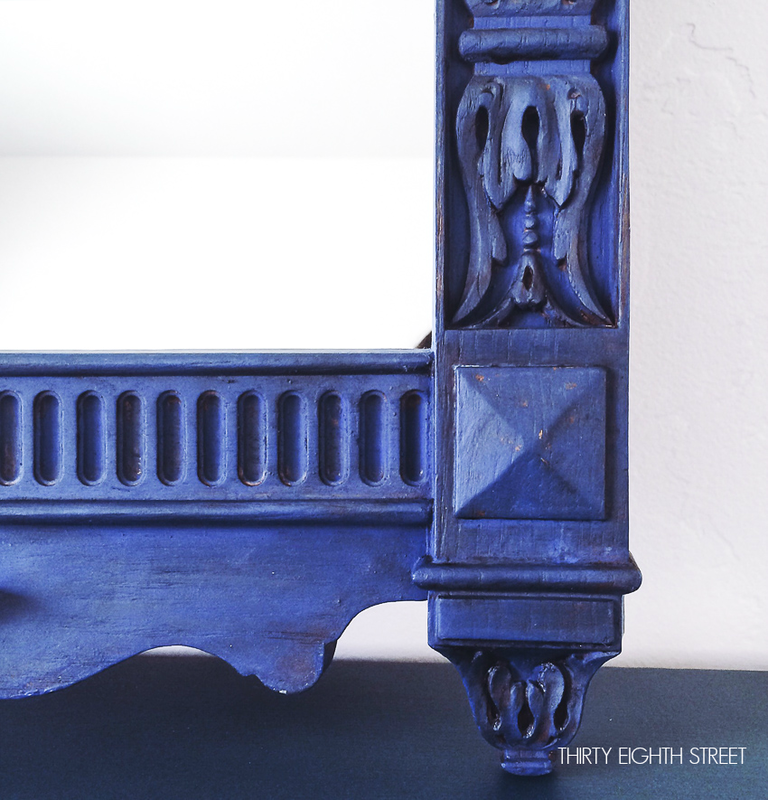 To get this layered look we started with Chalk Paint® decorative paint by Annie Sloan in Napoleonic Blue. We used this as our base coat and painted one coat of paint onto the mirror leaving some of the original wood coloring peaking through. Next, we dry brushed a layer of Napoleonic Blue mixed with Old Violet as well as Napoleonic mixed with Lamp Black. We used General Finishes Lamp Black and dry brushed that paint color along the edging and detail work. Can you see the layering taking place? (Top Right Hand Corner). The colors are working nicely together. Gradually, one layer at a time. Finally, we dry brushed our lightest color, a custom color of Napoleonic Blue and General Finishes Antique White and ran our paintbrush faintly along the edges as well as splattered a little bit here and there with our paint brush. We also splattered our darkest shade (Napoleonic Blue mixed with Lamp Black. (Bottom middle). And lastly, we took a damp rag and used our wet distressing technique to distress it before applying a top coat. That's it! I've got to show you this! Have you tried using a sponge applicator to apply your top coat before? If you haven't, you've got to! 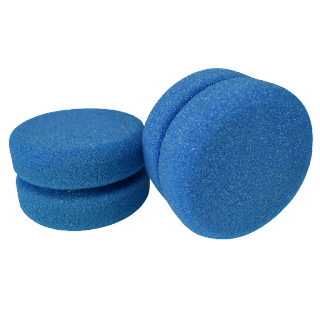 They sell for $3 a sponge and they are the absolute BEST! You know how you can sometimes see brush strokes when you apply your top coat with a brush? Plus it speeds up my top coat application process. I've used my sponge lots of times and it still looks and feels almost brand new. They are easy to use and are totally worth the $3! You just wash and rinse them after you use them and then leave it out to dry AND you can re-use them again and again! I get my sponge slightly damp and ring out the water just to soften up the sponge, then I dip the sponge part way into my topcoat just so you coat the very bottom of the sponge. (Hold onto the top section so your hands don't actually go into the top coat) and then I apply it right onto my furniture. They are fabulous, I tell ya! You can buy them here if you're interested in trying them out. If you landed on this post because you're interested in painting a mirror, I've got a few extra tricks for you! #1 Before you start painting your mirror, try to remove the glass. Sometimes that involves removing screws, staples, etc. Place your screws in a zip lock baggie to keep you organized and prevent you from losing any of the hardware. #2 Depending on the age of the mirror sometimes removing the mirror isn't an option and you'll have to leave the mirror in. No biggie! Some will advise you to tape off your mirror or line the mirror with paper or newspaper. But, that's too much work for me! I've refinished dozen of mirrors and the quickest and easiest way to paint a mirror is to just start painting it (after you've cleaned it)! I try to not get paint on the mirror but if paint gets on it, it's ok! Grab yourself a replacement blade like this one when you've finished creating your layered paint finish and scrape away the paint/wax/top coat from your mirror. A simple vacuum hose will pick up the scraping remnants. It works like a charm! #3 Will you be photographing or reselling your mirror? Take your mirror outside, photograph it up high or take the mirror out altogether (learned that one from a friend) and take a picture of just your frame. Here are a few additional layering paint questions that I've received from readers. In case you have a similar question, I'll share my responses.. Reader Question: Your mirror has a lot of details that are easy to highlight. What if my mirror has a flat surface? Will it look okay if I layer paint on it? 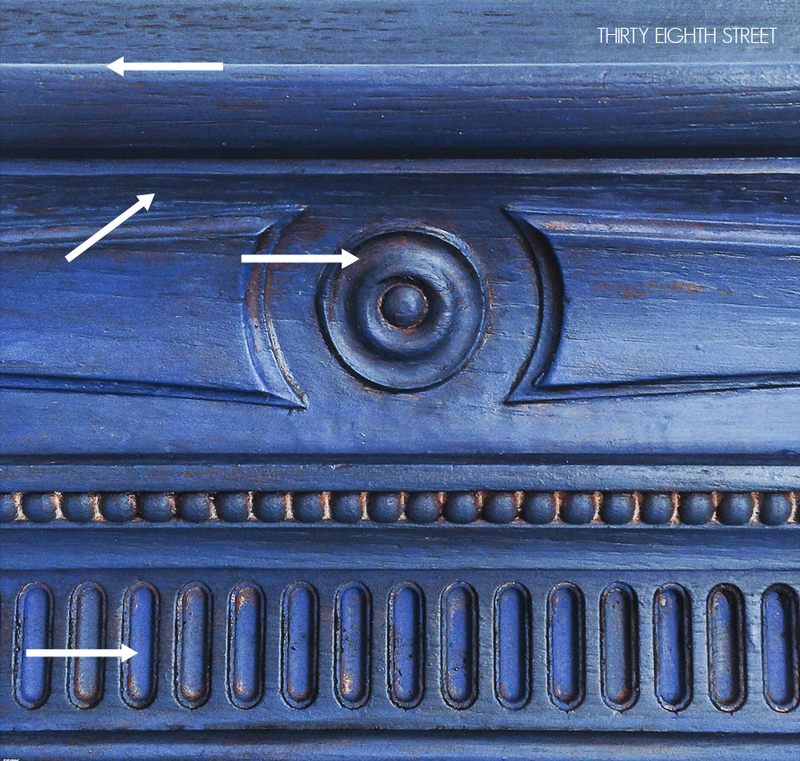 Answer: Layering paint colors, glazing, and reverse distressing are three fantastic techniques that you can use to emphasize the details of a piece of furniture or a mirror. But, you can also successfully layer chalk paint on flat surfaces too! You can see examples of that on our Layering Paint resource page! Reader Question: Hi there, How long should I wait in between paint colors? Should the first color be completely dry before I add the second? Answer: Great question! There are some additional painting techniques where working with wet paint actually works to my advantage and helps me manipulate the colors better. For the purposes of this tutorial and this mirror makeover, I let my paint colors dry inbetween layers- which didn't take long! Pin this article once you're finished then come back and enjoy ALL of our Layering Paint techniques and tutorials on this resource page! Do you have any questions about layering paint? What's the first project that you'd like to try this painting technique on? Leave your question/comment below, we'd love to hear from you! Have FUN getting your inner Picaso going! This mirror is beautiful! Love the color. Thanks so much for sharing with us at Snickerdoodle Sunday! Pinned and tweeted to share. Thank you for sharing our mirror, Laurie! This mirror turned out so pretty!! Thanks for sharing on Merry Mondays! I'm glad you liked it Angela! Thanks for hosting a fabulous party each week! Gorgeous color combo layering Carrie, love the depth it's really a beautiful finish! I love the way you combined the paint colors and layered them The mirror looks great. Thanks for stopping by, Debra! Your lovely words means so much! Hey Carrie! Just popping back in to say thanks so much for sharing your fabulous mirror makeover at Vintage Charm. Beautiful! I think the color is just gorgeous! Isn't it fun? Thanks so much, Cathy! Carrie, popping over from #2usestuesday to thank you for linking up this project with us! Hope you have a fantastic weekend! Your comment was duplicated so I tried to deleted one and ended up deleted both. Duh! Thanks so much for stopping by Dee and as always LOVE your party! Beautiful! Love the layering of the different blues. You had a great piece to work with--all that detail :) Great job. 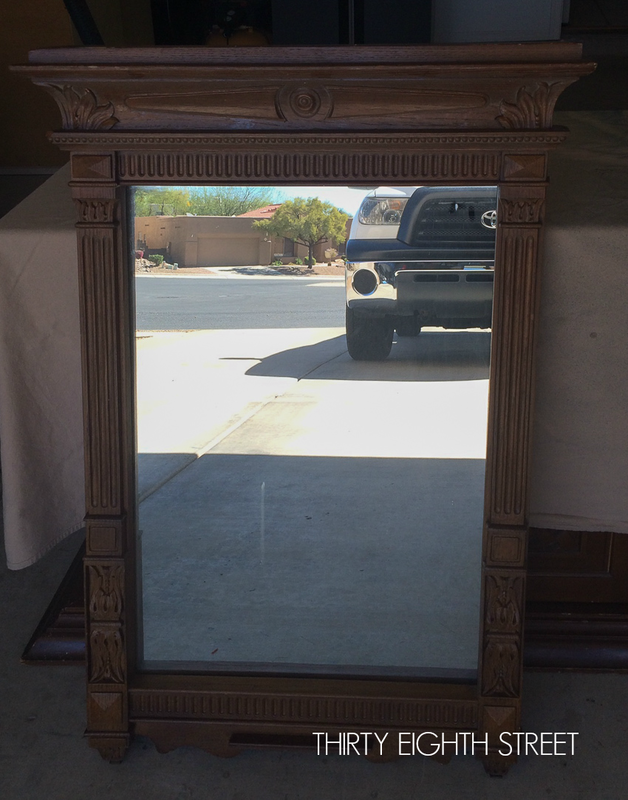 I couldn't believe the sellers wanted to give up all those juicy details in that mirror. It was a lucky find! Thanks, Melanie! LOL! Did you make this mirror just for me? My last name is Hamilton and blues are my colors! I love this. The layered colors are so perfect! Love it!!! This is gorgeous! Love the blue. Just letting you know I am featuring your mirror tonight on Best of the Weekend. Thanks for linking up! Wow! Thank you for sharing our work, Amy! Thank you, Emily! I appreciate it and I'd love to link up again. Have a great week! What a beautiful mirror! 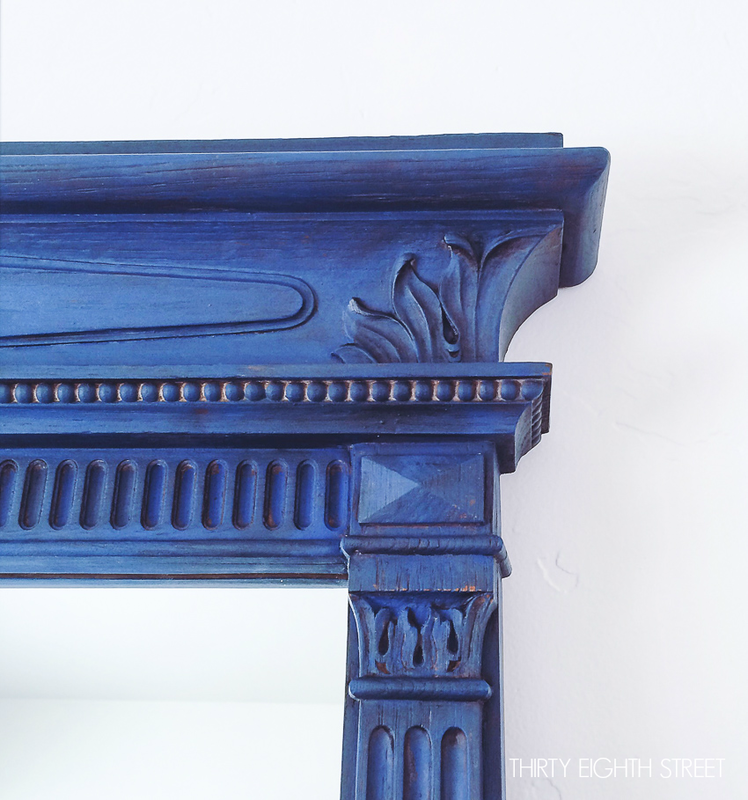 I would love to find one with this much molding--or else find this molding and make a frame myself! (I went to picture framing school, but this is a different type of frame that would require some different pieces). In the “take away method”, the instructions said “seal it with a top coat”. What is the actual name of this top coat product? Thanks. Hi! Thank you for asking, I failed to include that info! The top coat that I like to use is called General Finishes High Performance and its offered in a few different sheens. Flat, Semi-Gloss and Gloss.